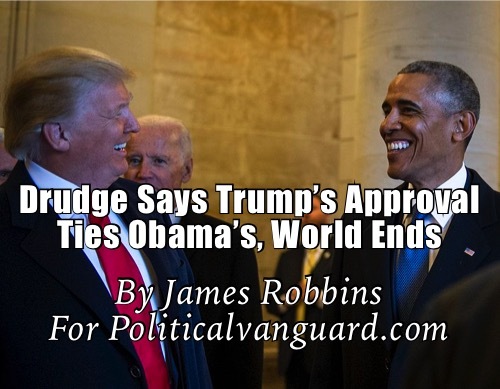 Matt Drudge shocked the world with his Thursday Tweet: “Rasmussen Poll shows Trump at 46% APPROVE this morning, with 53% DISAPPROVE… What about Obama at same exact date first year in presidency?? 46% APPROVE, 53% DISAPPROVE!” From the frantic responses on Drudge’s Twitter feed you’d think the world ended. The beauty of the Tweet is that it is so wonderfully counter-Narrative. After all we have been told for a year that Donald Trump has the lowest approval ratings of any President, that he is the most polarizing figure in politics, supremely unpopular, and whatnot. Meanwhile Barack Obama was recently crowned “the most admired man in the world” — according to a 17% plurality that is. Donald Trump was second in the same survey with 14%, in a poll with a 4% margin of error, so do the math. Part of the misconception is that Donald Trump is not as unpopular as the mainstream media likes to portray him. In the Rasmussen tracking poll for example Trump’s approval numbers arced down after the inauguration, reflecting the curve for most presidents, but since the summer they have been fairly stable. The RealClearPolitics average of polls shows a similar dynamic, with fluctuations up and down but no dramatic movements either way. The other Narrative mix-up is the belief that Barack Obama was a supremely popular president. He was not. For example, Obama’s Gallup approval numbers trailed George W. Bush’s for almost his entire first term. Obama’s first-term numbers were also well below Dwight D. Eisenhower’s, John F. Kennedy’s and even Richard Nixon’s. Obama’s misread of his mandate had dire political consequences. Aided by Congressional Democrats he pursued an unpopular legislative agenda that led to the 2010 midterm election bloodbath. Obama lost the largest Democratic Congressional governing majority in a generation with a sixty-three seat House switch to Republicans, the biggest such midterm shift since 1938, and a six-seat swing towards the GOP in the Senate. Obama’s 2012 reelection was the weakest in history. He attracted 9 million fewer popular votes than he did in 2008, the first president since George Washington ran unopposed in 1792 to accomplish this, and was also the first since 1916 to regain office with fewer electoral votes. The Senate went Republican in 2014 with a plus-nine seat swing. And at the end of his presidency Gallup dubbed Obama the most polarizing chief executive since its polling began. Critics may say that this is only one poll, and that other polls (such as Gallup) do not show Obama and Trump tied. That is true. But the shock value of the headline should be instructive to the Trump haters. The fact is that Donald Trump has a solid record of accomplishment so far, with 1.7 million new jobs, a manufacturing renaissance, Neil Gorsuch on the Supreme Court, the ISIS Caliphate virtually destroyed, and the largest tax cut in American history. As the president’s pro-growth economic and tax policies begin to kick in, his popularity will rise in the same way Ronald Reagan’s did. In fact the economy is already showing enough renewed vitality that Obama is trying to take credit for it. If Donald Trump’s approval rating passes Obama’s will they claim credit for that too?